Corn is also known as maize. I can’t see any other explanation for a maze made of corn, but let us embrace the season. Lucky for us, Nova Scotia has plenty of terrifying corn mazes to choose from: for the brave, RiverBreeze Fear Farm in Truro or Nights of Gore; for those with an inner toddler, Noggins Corner Farm in the Annapolis Valley. If you find your way out, treat yourself to this brand-new Kentucky Common ale, brewed with corn, from the experimental engineers at Good Robot. In case you’re thinking, “but I drink craft beer precisely because it’s not made with corn,” this sessionable bad boy features Sorachi Ace hops for a grassy, lemon flavour, and London ESB yeast for extra fruitiness. One of the things beer lovers most look forward to is the harvesting of fresh hops in late summer, and the resulting wet- (or fresh-) hopped ales in early fall. This newbie from the north end’s Belgian darling not only includes the floral aroma and crisp, less bitter flavour of fresh hops, but it’s done in the refreshing and tangy saison style, and aged on Annapolis Valley sour cherries. Watching the sun go down before dinnertime won’t be so bad with a growler of this tart little beauty by your side. Now that we’re “too old” to trick-or-treat, we’re either supposed to spend a week’s salary on a costume, get drunk and ruin it, or sit at home and GIVE AWAY what’s left of the candy we’ve been actually snacking on for weeks. This Halloween, disconnect that doorbell and hide in the dark with this fresh-hopped bitter Imperial Red Ale from Halifax’s hoppiest brewery. You’re bitter—your beer should be too. I promise it’s better than candy. Picking, carving, seed-roasting: the pumpkin has easily become fall’s favourite fruit—yes, fruit. Whether it’s the flavour you’re after, or the experience of traipsing around a field of these strange orange globules to find one that’s just right, no pumpkin lover’s repertoire is complete without the season’s most anticipated of ales. 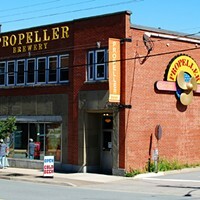 Propeller’s take features Annapolis Valley pumpkins and a festive blend of nutmeg, cloves and cinnamon. High carbonation and a burst of spice make this tasty treat autumn in a glass. One of the very best things about fall is that it provides ample opportunities for layering ourselves in comfy clothing. Sweaters! Flannel! Scarves! And there’s something about plaid that says I’ll keep you warm, even though I’m actually just a pattern. And if plaid had a counterpart in the world of grains, it would be rye—it thrives in cold, harsh climates and gives beer a dense, crisp flavour—not unlike a freshly laundered plaid jacket. 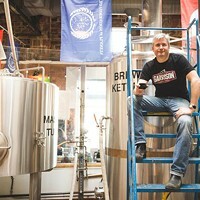 Roll up those fashionable sleeves and try this tasty mashup between Garrison and Ontario brewery Beau’s, featuring floral hops and bog myrtle.